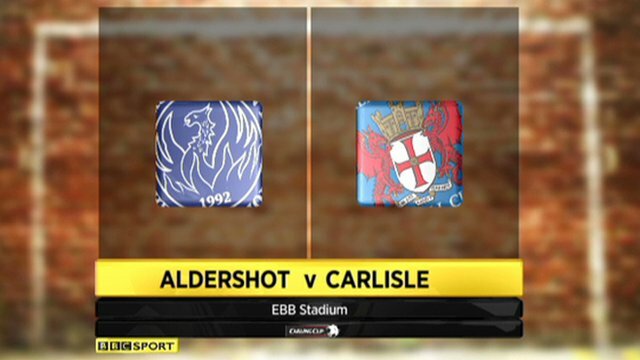 Aldershot booked their place in the Carling Cup third round with a convincing win against Carlisle. The visitors went close early on when Stephen O'Halloran had a header cleared off the line. But Aldershot took the lead after Luke Guttridge chipped the ball to Michael Rankine who fired a low shot into the left corner of the net. The Shots sealed it when Anthony Straker sent in a cross which Danny Livesey turned into his own net. The victory earned Aldershot a home tie with Rochdale in the next round. "It's a tremendous result. I don't think it's the best performance we've had, and we've been better and lost. So football has a funny way of equalling itself out. "But we'll take the result, we'll take the clean sheet and we'll take a goal from Michael Rankine who's earnt it. We'll take the confidence and hopefully push on in the league form. "There's still loads more to come from Michael Rankine - he was at his best, out of his feet, sticking it in the back of the net. He's still raw, but we know he's raw. That gives me a lot of pleasure as I brought him here". "It's a big disappointment, the amount of work we've put in for people to commend us and then we throw in this one, it's getting frustrating as a backroom staff. "They have to be responsible, we take the criticism, we take the pats on the back, we want to maintain an even keel and we keep having these blips. "We sat for an hour this afternoon talking about what it would be like, what they'll be like, the importance of the game and the importance of the performance and we haven't been given that back on the pitch tonight." 90:00+5:08 The final whistle is blown by the referee. 90:00+2:43 Substitution (Aldershot) makes a substitution, with Adam Mekki coming on for Danny Hylton. 87:49 Free kick awarded for an unfair challenge on Francois Zoko by Luke Guttridge. Adam Collin restarts play with the free kick. 85:13 James Berrett takes a inswinging corner to the near post, clearance made by Anthony Pulis. 84:23 Francois Zoko is penalised for handball and concedes a free kick. Ross Worner takes the indirect free kick. 83:16 Francois Zoko gives away a free kick for an unfair challenge on Anthony Pulis. Direct free kick taken by Ben Herd. 82:26 Aaron Morris challenges Francois Zoko unfairly and gives away a free kick. Adam Collin restarts play with the free kick. 81:26 Free kick awarded for an unfair challenge on Jamie Collins by James Berrett. Free kick taken by Anthony Straker. 79:24 Luke Guttridge produces a strike on goal direct from the free kick. 79:24 Booking Craig Curran receives a caution. 78:26 Booking James Berrett goes into the book. 78:11 Unfair challenge on Aaron Morris by James Berrett results in a free kick. 77:43 Unfair challenge on Jermaine McGlashan by Paul Thirlwell results in a free kick. Luke Guttridge restarts play with the free kick. 74:40 Assist on the goal came from Anthony Straker. 74:40 GOAL - Danny Livesey:Aldershot 2 - 0 Carlisle Danny Livesey scores an own goal. Aldershot 2-0 Carlisle. 73:34 Substitution Andrew Welsh goes off and Paul Thirlwell comes on. 72:14 Jermaine McGlashan concedes a free kick for a foul on Matthew Robson. Direct free kick taken by Matthew Robson. 69:35 Direct free kick taken by Adam Collin. 69:35 Booking Luke Guttridge receives a yellow card. 68:51 Unfair challenge on Stephen O'Halloran by Luke Guttridge results in a free kick. 67:09 Substitution Anthony Pulis is brought on as a substitute for Peter Vincenti. 66:23 Jamie Collins concedes a free kick for a foul on James Berrett. Tom Taiwo takes the direct free kick. 65:25 Jermaine McGlashan fouled by James Berrett, the ref awards a free kick. Direct free kick taken by Ben Herd. 63:33 Francois Zoko concedes a free kick for a foul on Luke Guttridge. Ben Herd restarts play with the free kick. Correction - 61:17 Substitution Rory Loy is brought on as a substitute for Jon-Paul McGovern. 61:17 Substitution Rory Loy comes on in place of Craig Curran. 58:37 Tom Taiwo gives away a free kick for an unfair challenge on Peter Vincenti. Free kick taken by Luke Guttridge. 57:26 Effort from the edge of the area by Jermaine McGlashan goes wide of the left-hand upright. 56:09 Peter Vincenti is caught offside. Adam Collin restarts play with the free kick. 55:35 Luke Guttridge fouled by James Berrett, the ref awards a free kick. Direct free kick taken by Ben Herd. 54:10 Headed effort from inside the area by Darren Jones misses to the left of the target. 53:35 Jamie Collins takes the free kick. 53:35 Booking The referee cautions Matthew Robson for unsporting behaviour. 53:25 Unfair challenge on Jermaine McGlashan by Matthew Robson results in a free kick. 51:18 Foul by Aaron Morris on Francois Zoko, free kick awarded. Free kick taken by Liam Noble. 50:47 The referee blows for offside against Craig Curran. Free kick taken by Ross Worner. 48:59 Luke Guttridge challenges Craig Curran unfairly and gives away a free kick. Liam Noble takes the free kick. 45:36 Danny Hylton takes a inswinging corner from the left by-line played to the near post, free kick awarded for a foul by Darren Jones on Adam Collin. Adam Collin takes the free kick. 45:01 Substitution Jermaine McGlashan is brought on as a substitute for Alex Rodman. 45:00+1:57 The referee calls an end to the first half. 45:00+0:48 Assist by Luke Guttridge. 45:00+0:48 GOAL - Michael Rankine:Aldershot 1 - 0 Carlisle Michael Rankine finds the back of the net with a goal from deep inside the penalty box to the bottom left corner of the goal. Aldershot 1-0 Carlisle. 44:09 Craig Curran is caught offside. Ross Worner takes the free kick. 33:44 Danny Hylton is ruled offside. Adam Collin restarts play with the free kick. 29:48 Free kick awarded for a foul by Craig Curran on Darren Jones. Free kick taken by Ross Worner. 26:44 Francois Zoko is caught offside. Indirect free kick taken by Ross Worner. 23:28 Peter Vincenti takes a shot. Save by Adam Collin. 21:31 Francois Zoko takes a shot from just outside the penalty area clears the crossbar. 19:39 Free kick awarded for a foul by Alex Rodman on Matthew Robson. Direct free kick taken by Adam Collin. 18:28 Inswinging corner taken right-footed by James Berrett from the left by-line, clearance by Michael Rankine. 17:24 Corner taken by Alex Rodman from the left by-line, Stephen O'Halloran makes a clearance. 11:25 Danny Hylton takes a shot from deep inside the box clearing the bar. 10:09 Corner taken left-footed by Andrew Welsh to the near post, Aaron Morris manages to make a clearance. 10:05 Corner taken by Andrew Welsh played to the near post, Ben Herd manages to make a clearance. 8:18 The assistant referee signals for offside against Alex Rodman. Indirect free kick taken by Adam Collin. 5:00 Francois Zoko is flagged offside by the assistant referee. Free kick taken by Ross Worner. 3:52 Francois Zoko is flagged offside by the assistant referee. Aaron Morris takes the indirect free kick. 2:18 Francois Zoko is ruled offside. Ben Herd takes the indirect free kick. 0:43 Peter Vincenti handles the ball and concedes a free kick. Free kick taken by Adam Collin.